We seek to encourage in our students a positive sense of self-worth, self-discipline, personal responsibility, successful interpersonal relationships, commitment to Gospel values, and a desire to contribute positively to both the global community and the immediate society in which they live. 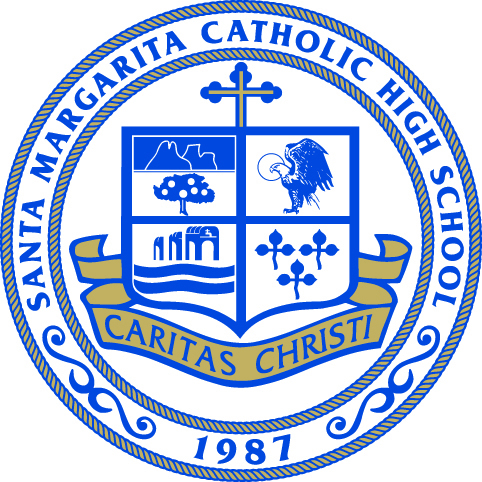 Santa Margarita Catholic High School (SMCHS) endeavors to bring the person and teachings of Jesus Christ to this time and place under the direction of the Bishop of Orange and in accordance with the Magisterium of the Catholic Church. We strive to emulate the accepting and nurturing way that He taught: to have faith in the Father, to demonstrate a loving, mutual respect for all, to seek opportunities to serve, and to be open to the thoughts and ideas of each individual. We are dedicated to working in union with families to provide a premier, holistic education encompassing the student’s religious, moral, intellectual, physical, and personal development within the framework of an effective college preparatory education. Demonstrating a faith-based knowledge of Catholic beliefs, traditions, and practices. Demonstrating a commitment to an ongoing relationship with God through prayer, and if appropriate, through the Sacraments and communal liturgical celebrations, as well as other ongoing co-curricular events. Demonstrating knowledge and application of the inherent connection between lived faith and works of charity, service, as well as social justice. Demonstrating the ability to express themselves orally and in writing, across various media, by meeting school standards demonstrated by competency that meets or exceeds state standards. Demonstrating critical thinking, analysis, and evaluation skills, as well as collaborative problem-solving aimed at inventive, adaptive solutions. Demonstrating competency in reading, writing, and mathematics demonstrated by achievement that meets or exceeds school and state standards. Demonstrating competency in identifying and finding information and resources necessary to develop personal goals and continuous learning. Demonstrating knowledge and application of the skills to practice a healthy lifestyle. Participating in wholesome activities that promote emotional and physical well being. Understanding the basic civic responsibilities of a citizen, demonstrated by an awareness and appreciation of the global community and the environment. Understanding the connections between choices and consequences by taking responsibility for their actions. Demonstrating the skills and qualities required for positive leadership.